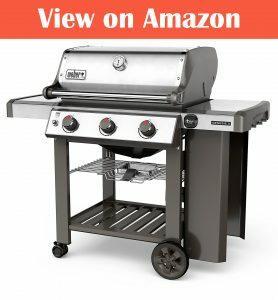 If you are on the market for a quality grill you will have likely heard of Weber. 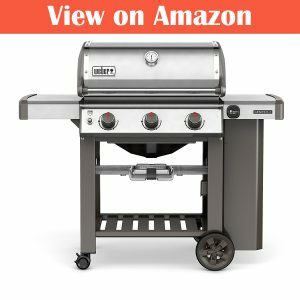 They specialize in some of the highest quality grills out there – but does this grill meet their quality that we are used to expecting from other Weber grills out there. I have used the grill now for 3 months and below I will cover everything about this grill, so you can get the best idea about the performance and overall quality of it. First of let me talk about the set up with this grill. The set up overall was quite easy and the instructions where well laid out and easy to follow along. The whole process of getting everything out of the box and put together took me about 1 hour – taking everything from the box took the longest though. Once you have the grill built you will see it in all its glory. The top half has a silver design will some stainless-steel parts. The bottom is a darker colored design. For me personally this is easily one of my favorite looking grills. Everything has a real clean finish and design that I really like. As for the form factor for the grill I really like the size of the grill. It is perfect size for home use – it offers plenty of space for cooking while still not remaining too big. The side shelves can also be folded down to make more space if needed. Now when it comes to the actual grilling this thing is excellent. It heats up really quickly along with keeping an even heat across the whole cooking area. Unlike some poorer quality grills there are no cold spots anywhere on this grill. Where the grill burners are they are direct covers over each of them, not only does this help distribute the heat evenly but if you are using oil on your meats for example and it drips down it won’t catch fire as the cover will prevent that from getting in connect with the heat source. This also keep the burners protected which is important for long term usage. The grill cooks perfectly well and creates some amazing sear marks that you will be craving again and again I am sure. The grates are made from cast iron which hold heat better than other options. They are also coated in porcelain which stops food from sticking and makes cleaning them a lot easier. Above the main cooking area there is a warming rack which can be used to cook foods more slowly or keep them warm while finishing up some other food. Also, the cooking hood can be closed down and the temperature can be monitored using the built-in thermometer which is nice. The grease management system is simple, but it works well. The grease flows down into a tray which can be replaced or cleaned easily. Also cleaning the heat covers is easy and the cooking grates are easy to remove and clean as well. Finally, I want to mention the overall durability of this grill. Everything is of high quality from the cooking grates to the burner dials everything has been designed and built using the best quality materials and that is covered with Webers 10-year warranty which is a nice piece of mind to have as well. I have tested a host of different grills and if you are looking for a grill for home use for yourself and your family this grill is probably the perfect fit for you. Of course, it isn’t the cheapest grill out there, but it will last for many years to come and may in fact save you money in the long run versus buying a cheaper counterpart. I totally recommend this grill.